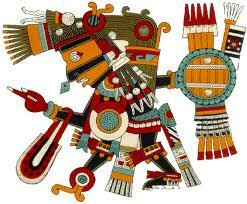 Temazcalteci, was the Aztec goddess of steam baths/bathing, medicine and cleanliness(physical/spiritual). Patroness of healers, midwives, women giving birth, fortunetellers, witches and herbs that are related to maintaining health, and female reproduction. Temazcalteci was the heart of the Earth and the tree of life with flowers that bloomed in four colors, representing the fore directions of the universe. She was the grandmother of the temazcalli, or sweathouse, symbolic of the womb. Sick people into the sweathouse to be reborn on the way out. While she lacked a totem animal, she was often represented by healing herbs and charms, water and hag puppets.